Been beta testing this for a while now and it works well. One thing I have noticed is that files that are stored solely in the cloud will get automatically pulled down when you start an application it's associated with for some strange reason. For example, if I create a PDF using Preview and then mark it to 'Free up Space' which removes the local copy, the file will be retrieved the next time I open Preview. Note that I'm not choosing to open the file, just opening Preview for a general reason. That said, for about 99% of the other files it behaves just fine. I have 127GB in the cloud and the local copies ATM only take up 53MB on my disk. I really wish Apple push out a way to do this as well. This can be done with Apple's office suite software. This sounds really great. I wish Dropbox would do something like this w/o having to have a high-end plan (for which, aside from the price, they actually REMOVE features!). I'll have to look into this when it gets finalized, as I'm starting to get a bit fed-up with Dropbox's now outdated model (given small core storage spaces). 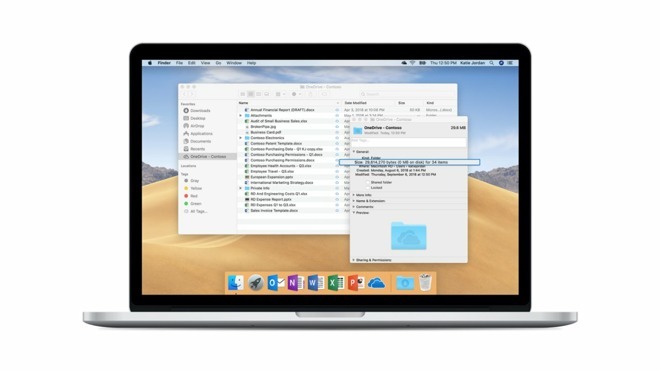 iCloud files are "on demand" or are they always synced and taking up space on the drive? I really wish Apple push out a way to do this as well. iCloud Drive has always done this. I was shocked when OneDrive didn’t. Apple needs to work on localising whole folders and local network vs local device caching. iCloud Drive Desktop & Documents sync has always done this. Super handy. Everything is stored locally on my iMac with its huge drive, and backed up with versioning to time machine - but everything is available but does not take up space on my iPhone, iPad, and MacBook, all which have far less storage.